QUESTION (1) Rudraprayag District was established on? QUESTION (2) The Uttarakhand state is divided into divisions? QUESTION (3) British woman Hielamen known as ‘Sarla Bahen’ her working field was ? QUESTION (4) Papers were thrown in U.P. Assembly for the formation of Uttarakhand on? QUESTION (5) Which of the following is not properly matched? QUESTION (6) The world famous ‘Valley of flowers’ is situated at ? QUESTION (7) How many district share boundary with Nainital? QUESTION (8) At which place does river Bhagirathi merge with Alakananda? 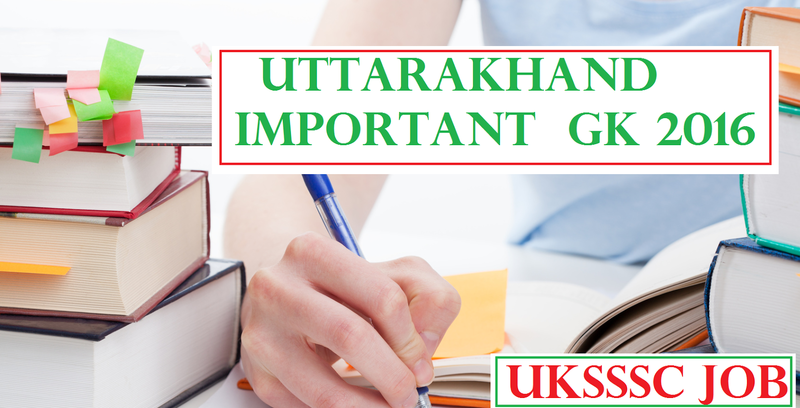 QUESTION (9) In which district of Uttarakhand, Lakha Mandal is situated? QUESTION (10) Which of the following is not a Tribe of Uttarakhand? QUESTION (11) In Who led the Chipko Movement? QUESTION (12) From which year ‘Almora Akhbar’ published? QUESTION (13) Vishnugarh Pipalkoti Hydel Power Project is being developed on one amongst the following rivers? QUESTION (14) Which one of the following is known as the queen of hills of Uttarakhand? QUESTION (15) Which of the following countries, boundaries touch the Uttarakhand state? QUESTION (16) Where is the tradition of ‘Long and Bhella dance’ in Uttarakhand? QUESTION (17) Who among the following is called the ‘Gandhi’ of Uttarakhand? QUESTION (18) What is ‘Milam’ ? QUESTION (19) Previously what was the name of Uttarakhand? QUESTION (20) Who made Garhwal Painting?